Native video continues to be the type of web content that performs the best on Facebook, getting the most engagements among top posts and generating more shares than every other content format. Native video continues to be the type of web content that performs the best on Facebook, getting the most engagements among top posts and generating more shares than every other content format, according to research done by social media analytics company NewsWhip. 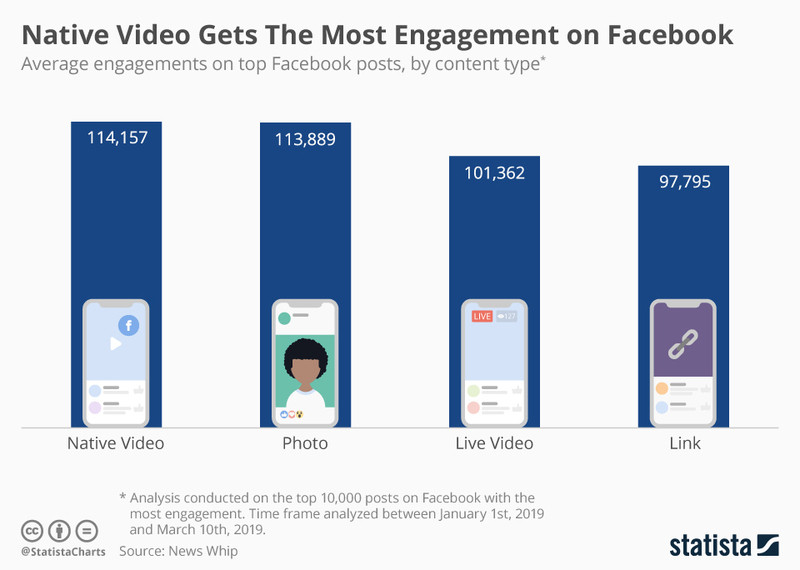 Among the 10,000 Facebook posts with the most engagement, native video and photo on average generated 114,000 interactions between likes, comments, and shares. Both formats by far outperformed live video and links, which fell into a completely different league. A typical top post with a live video or link would garner roughly 100,000 engagements. While native video and photo both were able to attract users to their posts, native video produced the greatest number of shares when compared to photos, links, or live videos on average, making the format an important way of expanding content into different networks. Generally, engagement was up for Facebook content, rising by about 55 percent year-over-year, when NewsWhip compared interactions on the social network between the first part of 2018 and the first part of 2019. Facebook pages that performed the best were either meme or community-focused pages that centered around cooking or self-help activities. Traditional publishers had a hard time gaining the same amount of interaction with their pages. Fox News was the only publisher in the top 10 ranking for page engagements and CNN was the only other publisher in the top fifteen.